Pete Erskine has provided communications design, RF and operational services to entertainment professionals around the world. His clients have included the Commission on Presidential Debates (CPD), Walt Disney Productions, The National Football League, and the Olympic Games and Clair Broadcast. Over the years, Erskine has developed a reputation not only for excellent design, audio engineering, and communication systems skills, but also for his ability to rescue the show under the most adverse conditions and under great pressure. In 2016, he worked on the Olympics and Paralympics in Rio doing the Ceremonies intercom. This was be his 15th and 16th Olympics. With the closing of the Clait wireless office in New York, Pete returned to the freelance job market, including, of course working for Clair Broadcast. Any and all clients are welcome now. This 2016 summer, Riedel Communications hired me to work on another mega event like I have done for them before. This will be my 17 and 18th time doing events this size and experience paves the way to do more. Each time they provide the pinnacle of comms systems. The massive communications system allowed very comfortable and vital communications during rehearsals and the actual show. Everyone has access to almost all channels and usually communicate to me for any changes in their panel. Of course the equipment is only the tool. Until April 2015, Pete is on tour with Katy Perry in charge of RF (80 frequencies) and intercom (RTS and BTR systems). Nov 1-Dec 21 they were in Australia. Feb thru March they toured Europe. The tour went well. The main job was maintaining the RF coordination and the BTR comm system for the automation cues. The tour now goes to Asia without any automation or comms so Pete is back in NYC for a while. The tour's RF scans can be found HERE. After the Olympics, Erskine returned to the United States and jumped into Comms and Backup audio mixer for the Presidential and Vice-Presidential Debates. The events were held in four cities within a month. This time, Erskine used Clear-Com equipment exclusively. The system was comprised of a triple node Eclipse digital intercom, 5 base station intelligent roaming Tempest wireless, and HelixNet digital wired beltpacks. Working as the wired comms manager for Riedel Communications during the London 2012 Olympic Games, Erskine programmed and operated the Artist digital intercom system. Fourteen nodes spread throughout the venue, distributing 150 panels and 175 digital beltpacks for the Olympic and Paralympics ceremonies. Erskine was the RF coordinator for the Eurovision Song Contest in Baku, Azerbaijan. Eurovision is the longest running international TV event in the world. It requires over a hundred mic and in-ear monitor frequencies. The actual management of this equipment was handled by Sennheiser. In addition, the lighting required Wireless DMX for critical parts of the set. Erskine mapped the WiFi in the hall and arranged for sections of the spectrum to be cleared for lighting. The Jimmy Fallon Show produced their first live broadcast after Super Bowl XLVI. Working for Clair Broadcast (formerly Wireless First), Erskine coordinated the RF frequencies and managed the intercom system. RF was a challenge with almost 150 frequencies. The antenna system was designed to cover not only the theatre, but also the street, along with the dressing rooms and basement in the next building. Josh Flower from Wireless First came up with a great way to monitor the forty-eight wireless mics. He fed a split into the Riedel and used Riedel stations to select for monitoring. Flower also monitored two computers—one running Shure wireless workbench and the other Sennheiser wireless monitors— so everyone could determine the RF land battery level of all the mics. The Adam system inside the Game Creek truck was combined with a Riedel Artist. Erskine created six party line connections and ten P-P connections between both systems. When a user needed a change in their panel, Erskine quickly answered their request using EveEdit, a control system for the iPhone designed by Jess Heimlich. In January 2009, Erskine worked with Larry Estrin on the Inaugural Balls for President Obama. Estrin was the technical director for all ten Balls and Erskine provided frequency coordination. Erskine worked for Riedel as the comms manager at the Whistler Medals Plaza for the Vancouver Winter Olympics. Bruce Kraemer was Erskine's assistant at the event. The comms system made use of a single Artist node with a dozen panels and digital beltpacks. During the summer of 2008, Erskine traveled to Beijing for the Olympic Games. He worked for Riedel Communications as the wired Comms Manager along with sixteen other crew at the opening and closing ceremonies of the Olympics and Paralympics. Erskine was the sole person responsible for programming the Artist Digital comm system—possibly the largest intercom system ever assembled for an Olympic opening ceremony. After the Beijing Olympics, Erskine joined Kraemer on tour for the Presidential and Vice Presidential debates. This was the fifth set of debates for Erskine, beginning in 1992 with Clinton, Bush and Perot. Take a look at the layout used in 2004, HERE. During November and December 2008, Clair Brothers hired Erskine as the RF and comms coordinator on the first arena tour for the Radio City Christmas Spectacular. The tour was a huge production—nineteen cities and almost a hundred shows in two months. Erskine picked frequencies and designed the comm system by Wireless First. In 2008, Pope Benedict XVI visited New York City. Best Audio was in charge of all communications and media coordination. This included the production comm systems by Riedel and RTS and production radios and over five hundred Sprint Nextels for citywide communications. 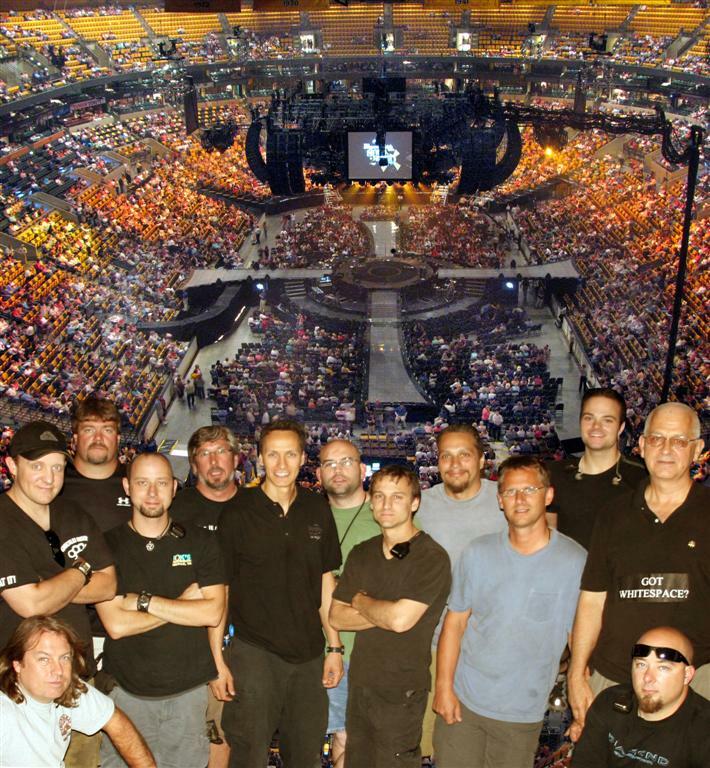 Erskine designed the comm systems for the Ground Zero site, the St. Joseph Youth Rally, and the Yankee Stadium Mass. Faith Hill rehearses Red Umbrella onstage without an audience. In 2006 and 2007, Erskine was hired as the frequency coordinator for the Faith Hill and Tim McGraw Soul 2 Soul II tour. The RF system was assembled by the tour staff and Rick Lehman from Clair Brothers Audio directed the development of the system with Sennheiser. Erskine was the RF coordinator for the thirty-nine RF mics, ears and instrument systems. The stage was almost entirely made up of high-definition LED panels, raising the entire RF noise floor between 500 to 750 MHz. Careful antenna placement and particular attention to minimum intermodulation coordination made it a success. In the end, it came down to testing each instrument and ear wireless on the stage and trying different frequencies to locate the best combination. At the 2006 Torino Italy Winter Olympics, Erskine was the design and operations engineer for a massive Riedel Digital intercom system. It included two fully loaded Artist M nodes and three Artist S Nodes for a total system size of 352 ports. Over forty master panels, almost a hundred digital C2 beltpacks and twenty-four radio channels were used on sixty separate PL channels for the largest winter Olympics intercom system ever assembled. starting in 1989, Erskine has provided audio for The Spirit of Liberty awards banquet. Working with the producer, Jules Fisher, he designs, coordinates and installs the sound for the annual dinner party. 2004 marked the 18th anniversary, which was celebrated at Roseland Ballroom. In order to facilitate the smoothest operation of this live event, Erskine specified the Yamaha PM1D console—perfect for instantaneous changes in the show. The console was provided by Pro Mix and the operator was Mac Kerr. In 2004, Erskine was the engineer for communication and Riedel digital matrix intercom system operation during the presidential debates. Erskine’s main job was the primary transport of audio with the digital Artist S system. The candidates’ and moderator microphones (including the infamous Buzzer audio) were carried digitally on the system's single mode fiber. Check out the system drawing HERE. Riedel was selected to provide all of the intercom for managing the sporting events at the 2004 Athens Summer Olympics. The system consisted of over thirty digital matrix Artist S systems with several multiple nodes. Erskine managed the Olympic stadium system. It was the largest of the systems featuring three nodes, eighteen desktop DCP-1016e, sixteen channels of the new digital C3 two channel belt packs, and three Riface Motorola radio interfaces. Two nodes were located in the sport control booth and one at the TV compound almost five-hundred meters away. All three announcers—Greek, French and English—used the DCP-1016e panels as their main stadium microphones. The cueing of the events was smooth with AES/EBU digital quality audio feeding the house PA and communication with the sports event stage managers all in one system. In September of 2002, Erskine was hired to program a massive Peavey Media Matrix system at the Nan Shan Insurance company training center in Taichung, Taiwan. Best Audio was the equipment supplier to their contractor, Linfair Engineering and Trading, LTD. The system featured three mainframes for seven theatres and a master AV control room. Erskine was in charge of the communications system for the Opening Ceremonies at the Paralympics in Salt Lake City in 2002. The intercom system was supplied by Keith Hall from Audio Specialties Group. The main component was a digital Matrix intercom system made by Riedel. During the Paralympics Closing Ceremonies, Erskine was Technical Director of TV Audio and provided the TV mix for the event. In May of 2002, Erskine designed and installed the audio and radio transmission equipment for a synchronized music parade at Discovery World in Taichung, Taiwan. The parade included twelve floats with their own sound systems. The audio was supplied by a radio receiver. Music was synchronized for the parade and throughout the park. Almost a hundred dancers and actors performed each day. Best Audio’s Peter Erskine and Laurence Estrin have designed audio for several "electric parades" in Asian amusement parks. All the parades featured multi-track audio playback with background music and baseline throughout the park, along with specific melodies transmitted via multi-channel RF to the floats. In 1999, the National Football League and the Society of Broadcast Engineers began a pro-active program in every NFL venue to coordinate radio frequencies. For the first four years of the program, Erskine was the primary NFL Frequency Coordinator for the NY Giants or NY Jets. In the process, he developed a series of RF coordination tools which can be downloaded on the Best Audio website. He is still currently a Backup Frequency Coordinator for the NFL. In 1991, with Theatre Technology's purchase of the first digital intercom system in a rental company ever from Clear-Com, Erskine firmly established himself in the field of production communications. He designed and supervised its use at the Superbowl, the Barcelona Olympics and Paralympics. At the Barcelona Olympics, Best Audio laid down over nine miles of cable, constructing the world’s largest production intercom system for a single show to date. The system connected several venues, provided communication for the opening and closing ceremonies, and interconnected over two-hundred people in eighteen different departments including the producers, stage managers, and technical crew. Erskine was the principal sound designer for one of New York City's favorite seasonal events—the lighting of the Christmas tree at Rockefeller Center (1991-1997). He returned to the Tree Lighting in 2003 with Wireless First to supply the communications systems. The Riedel Intercom system provided not only superior computerized intercom matrix stations, but was also a key route of AES/EBU audio between the site and TV truck over two-thousand feet away. For ten years (1998-1999), Erskine worked with BEXEL to develop audio and communications rental facilities at their New York office. He also worked as an account executive for the broadcast video department and greatly expanded his knowledge of professional video equipment. During his Columbia College years, Erskine spent as lot of time at WKCR, the student radio station and began to learn audio. In 1969 he was hired by Bob Tourkow from Creative Theatrical and did A2 work in Central Park Rheingold Music festival and The New York Shakespeare festival. After that contact with theatre, Erskine became the co-head engineer along with Louis Shapiro of the new, in-house, audio department for the New York Shakespeare Festival in 1970. He designed the sound systems and produced the audio tapes for many of the theater’s productions. Erskine opened his first company in 1972 with Louis Shapiro. Their company, Erskine-Shapiro Theatre Technology, developed into an audio rental shop, recording studio, engineering and design firm that prospered for almost a quarter of a century. During his time with Erskine-Shapiro Theatre Technology, Erskine co-designed Rental software with Production Arts Lighting. Nicknamed "rent control", it became the basis for the final incarnation written by Michael Rhodes for all rental scheduling and billing for Production Arts Lighting and Pro Mix (now PRG), Production Resource Group companies until their switch to Oracle in 1999. Erskine continues to consult on computer software. During his years with Theatre Technology, Erskine designed, installed, operated, and mixed sound for many live events, theater productions, and national celebrations. These productions include the opening of the South Street Seaport in New York City and the Centennial Celebration for Coca-Cola in Atlanta, Georgia. Peter Erskine's first collaboration with Larry Estrin initially began in the early 1980s. Together they worked on several major New York events—the 50th anniversary celebration of the NBC Television Network, the revitalization of Radio City Music Hall and the celebration commemorating the reopening of the Statute of Liberty and Ellis Island, Liberty Weekend. In 1990, Erskine and Lou expanded by joining Laurence Estrin, the sole owner of Best Audio in Los Angeles. Together they formed a joint venture company, Best Audio East. Their goal was to create wider opportunity and ease for providing audio and communication services on both coasts.